My bullet dodge ability and building dodge skills could use some work, but at least my judging ability is sound and my coolness very high. At least that’s what Shmups Skill Test, from Triangle Service and Degica tells me. It also informed me that my “Gamer Age” is 33 years, which I guess isn’t too bad, at least not compared to what I’ve been told by the Brain Training games and Wii Fit. Shmups Skill Test arrived at this conclusion after, as the name suggests, it threw a bunch of quick mini-games at me to test my proficiency. It is a title that can, depending on your skill level with the genre, provide a nice ego boost or a reality check. If Shmups Skill Test sounds familiar it is because it was originally part of the Japanese arcade game, Shooting Love 2007. The compilation eventually made its way to Xbox 360 in North America and Europe as Shooting Love 200X, and now PC gamers can join in on the fun. Don’t worry as the other games in the collection, MINUS ZERO, TRIZEAL Remix and EXZEAL will also see PC releases as individual titles. Given its age and relative simplicity Shmups Skill Test is probably not the most impressive title out of the lot, but it does allow players to get in some practice ahead of the other incoming shooters. Visually the game is very basic and it has no widescreen support. This is to be expected as the playing field is vertical, but it definitely contributes to the dated feel of the game. The position and scaling of the playing field can be adjusted, but neither of these help much to improve the visuals. The playing field can be rotated, which is great for those with adjustable monitors and there is a choice between “point” and linear” for the interpolation method. The mini-games are quite varied, but once again the visuals are Playstation One era quality at best. A spruced up and enhanced version of the game, at least as far as the graphics are concerned would have been nice, but at least Shmups Skill Test comes with a bargain bin price tag. The audio fares a bit better, but some of the tunes are definitely a little on the strange side. There is even a version of The Skater’s Waltz by Émile Waldteufel to give you an idea just how unconventional the soundtrack is. However, it is the gameplay that really counts and this is where Shmups Skill Test still holds up well. The game features a myriad of challenges that are thrown at you in rapid succession, giving it an almost Wariorware style feel. The game doesn’t waste a lot of time on explaining exactly what you have to do either, but thankfully most of the tasks are relatively straightforward. Whether it is protecting the earth from incoming meteors, trying to shoot spinning cans into a trash bin, blasting tanks, dodging buildings, or trying to grab the correct power-ups, the games are all quick, challenging, and entertaining. The mini-games are also over quite quickly, but you are given a random selection each time you play. All the mini-games focus on skills that are important in the shmup genre, such as shooting, dodging and timing. This means if you get a young “gamer age” in this game you definitely have the right skills to do well in other shooters. In addition to taking the Solo Test, you are also able to practice any of the previously encountered mini-games. The game also features 2 Players Versus and 4 Player Versus modes, along with score attack and challenges. Replays can be recorded for bragging rights and the game supports leaderboards as well as Steam achievements. The controls are very straightforward as for most of the games you are either dodging, shooting or a combination of the two, but a decent controller is still recommended for the best experience. With its short, intense challenges, local multiplayer support and low price tag there is a lot to like about Shmups Skill Test. It is not the best looking or most in-depth example of the genre, but it offers a novel approach measuring your skills. It is also the type of game that you can return to time and again to make sure that your bullet hell shooter abilities stay sharp. 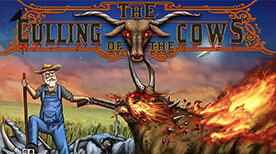 The Culling of the Cows is an action packed arcade experience with a nice visual style. Blasting the enemies requires a quick trigger finger, but the inclusion of assists and upgrades ads a strategic element to the gameplay as well. If you can appreciate a good shooter with a rather dark sense of humor you will find a lot to like about The Culling of The Cows. Gameplay: A challenging arcade shooter that requires some strategic thinking as well. Graphics: Nice hand-drawn visual style with plenty of detail. Sound: The music and sound effects match the gameplay perfectly. Nerdook once again impresses with a title that delivers turn-based strategy in an engaging, humorous and very accessible manner. The visuals are charming, the gameplay addictive and although short, there are enough reasons to replay the game a couple of times. Anyone looking for a turn-based strategy title that can be enjoyed without a degree in military tactics should definitely add Reverse Crawl to their library. Gameplay: Easy to play, but with enough depth to keep it interesting right to the end. Graphics: Features the typical charming Nerdook visual style. Sound: No voice acting, but the music is pleasant enough.